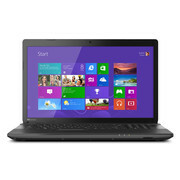 The C-series - Toshiba's ultra-budget line - encompasses both 15.6 and 17.3-inch models in various configurations. 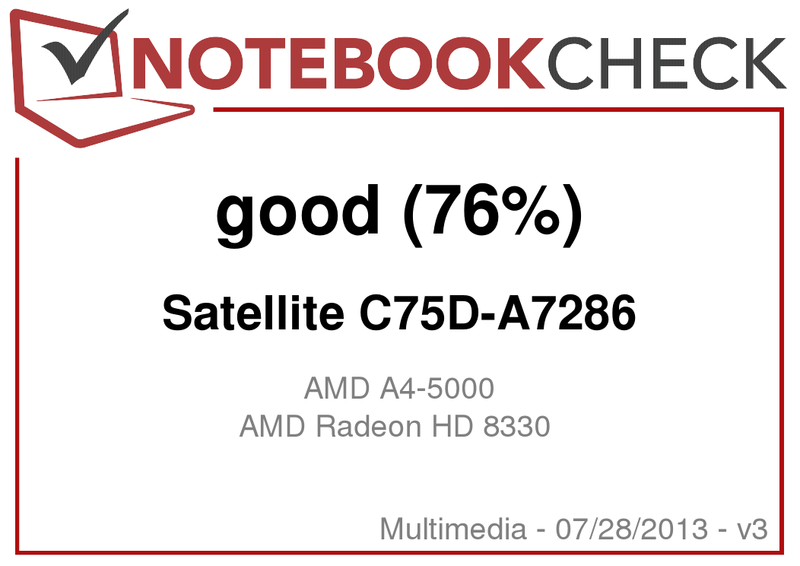 At the time of writing, the C75D-A7286 is the only AMD-powered offering in the 17.3-inch series - the other models are equipped with low-end Intel processors. With a basic no-frills design, a quad-core A4-5000M APU with integrated Radeon HD 8330 graphics, 6 GB of RAM, and a 17.3-inch, 1600 x 900 display, the $480 C75D-A7286 looks like it could be an ideal large-screen solution for everyday computing. 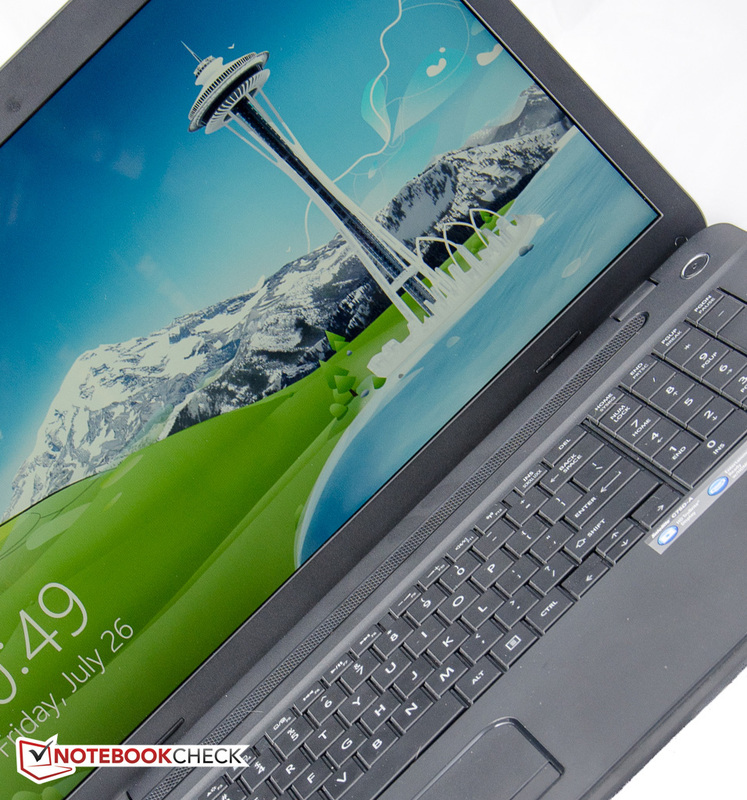 Many competing notebooks, like the Acer V3-731-4446, Dell Inspiron 17, or Asus F75A (see our review of the F75A-TY089H here) offer similar configurations, but are often based on Intel's lower-end Celeron, Pentium, and i3 CPUs for roughly the same amount of money. 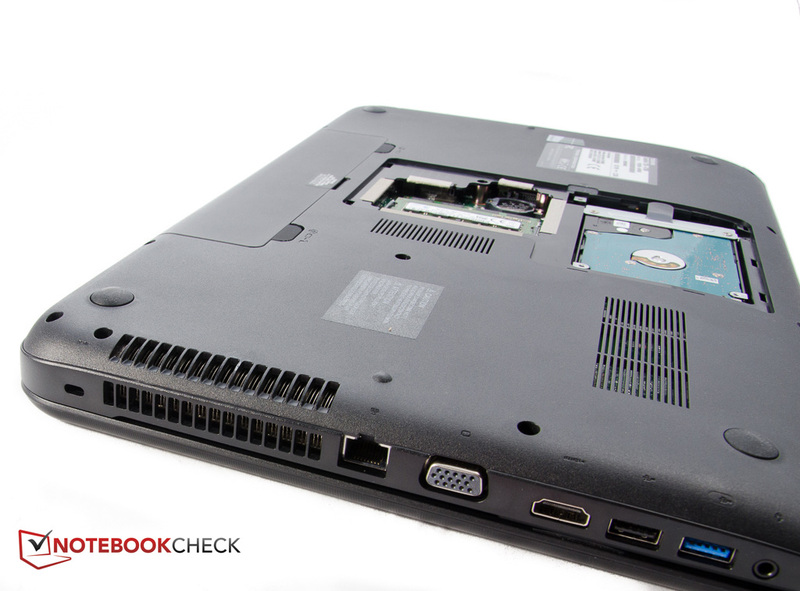 Is the inexpensive AMD 17.3-inch notebook a sensible choice over the Intel-equipped competition? With its generously rounded corners, the C75D actually doesn't appear nearly as massive as the rather large foot print of 415 x 270 x 37 mm (34 mm without the rubber feet) would suggest. 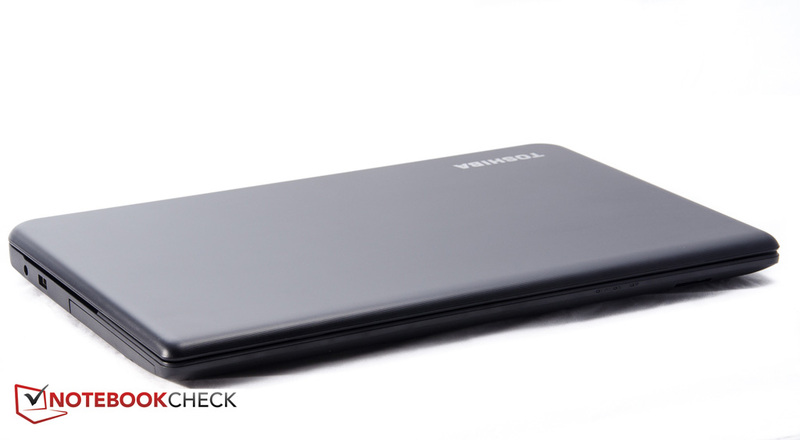 We were pleasantly surprised by the weight of only 2.64 kg, which is at least partly due to the choice of materials: the entire chassis is constructed from black, matte plastic - and although Toshiba added a textured pinstriping pattern called "Trax Horizon" to the lid and the palm rest, the notebook can't belie its budget status. 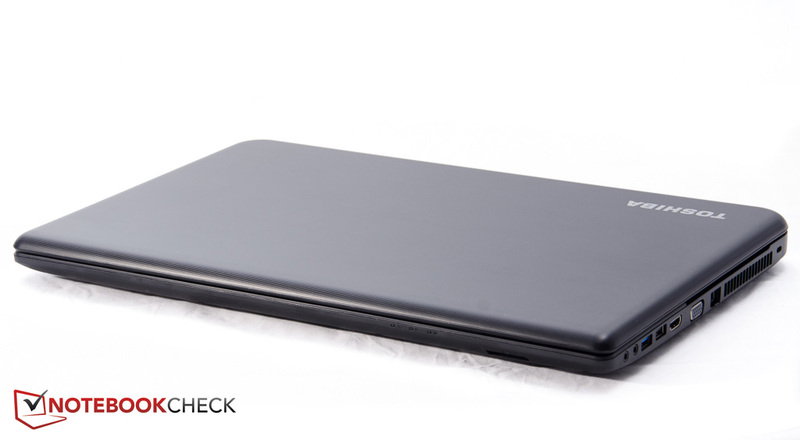 The lid and the palm rest are prone to fingerprints even when the notebook is handled with fairly clean hands, so it's advisable to keep a cleaning cloth handy. Build quality is quite good, although the chassis doesn't feel overly robust and flexes when twisted. 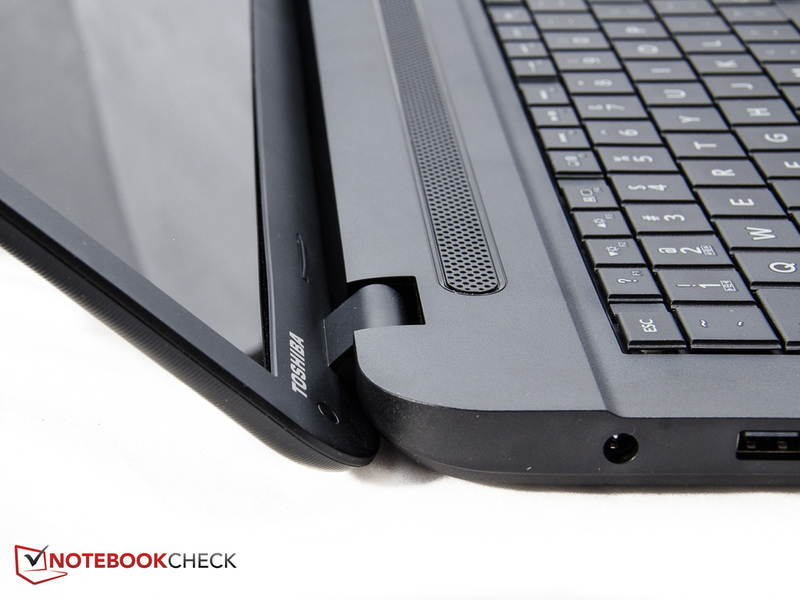 The palm rest and keyboard also bend easily when a fairly modest amount of pressure is applied. 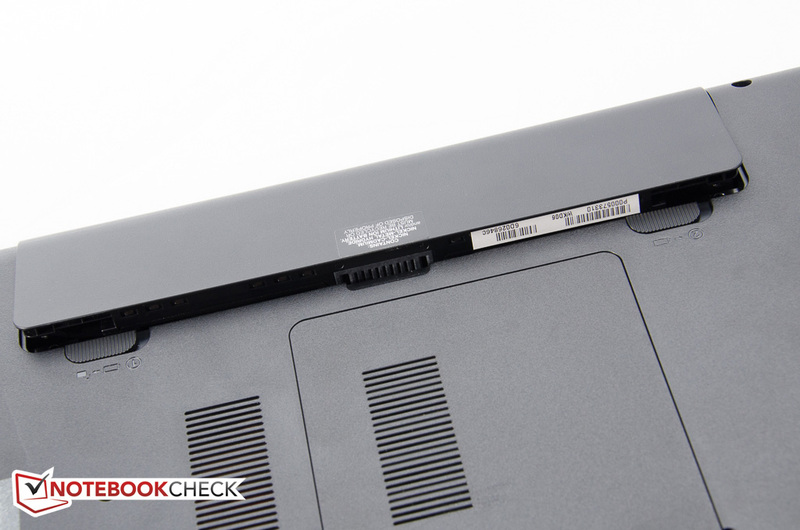 While the hinges do manage to hold the display securely throughout the range, they can't prevent a very noticeable display bounce when the lid is opened or when the notebook is subjected to vibrations. 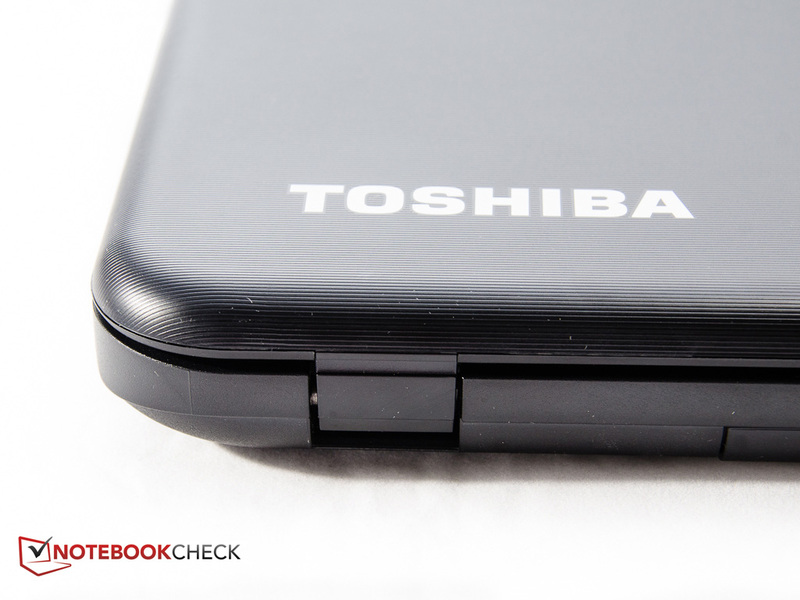 Toshiba would have to use a sturdier design with more substantial hinges in order to prevent that. 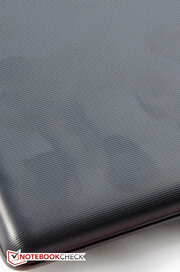 The lid also twists easily but requires moderate to strong pressure on the back to induce visible ripples on the display itself. 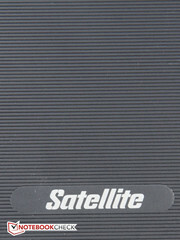 There is nothing to get overly excited about when it comes to the Satellite C75D's selection of ports. Although there are both a VGA output and an HDMI port, the system comes with only three USB ports, two of which are USB 2.0. The RJ-45 Lan port also only supports 10/100 Ethernet instead of the increasingly common Gigabit Ethernet. A memory card reader, a DVD-RW drive, and separate headphone and microphone jacks round out the connectivity options. Overall, a pretty modest offering - given the size of the notebook, we would've liked to see at least one more USB 3.0 port. The location of most of the ports on the right towards the very front edge and their proximity to each other is also bound to create some problems: when we plugged in an monitor using HDMI, we had issues using an external mouse, as the HDMI cable juts out right over the mouse pad and gets in the way of operation. A Realtek RTL8188E provides 802.11b/g/n Wifi connectivity. The module supports the 2.4 GHz band with theoretical speeds up to 150 mbps, but doesn't offer Bluetooth. Our connectivity test showed no apparent issues with signal strength or stability. 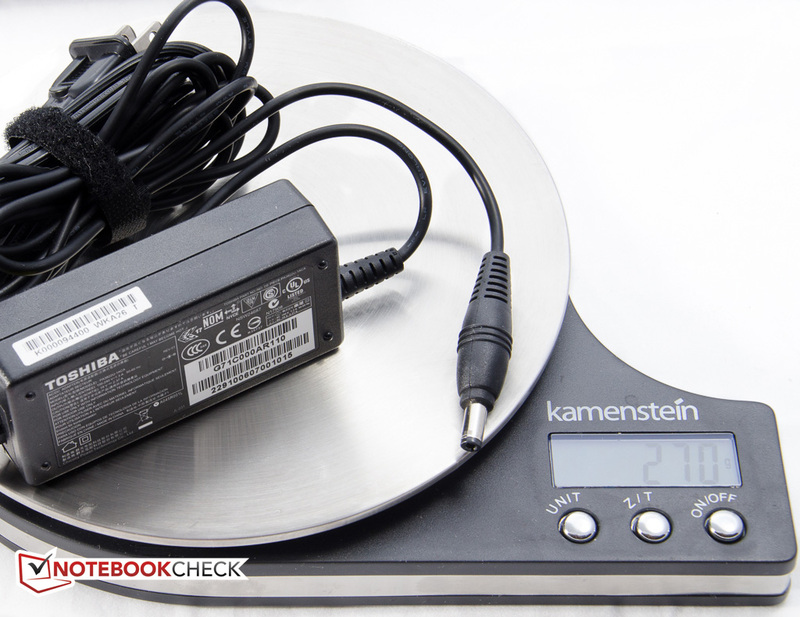 In addition to the 6 cell, 48 Wh Lithium Ion battery pack and a quickstart guide, Toshiba only includes the diminutive 45W (19V, 2.37A) power adapter, which adds 260 grams to the weight of the notebook. The C75D ships with Windows 8 64-bit. 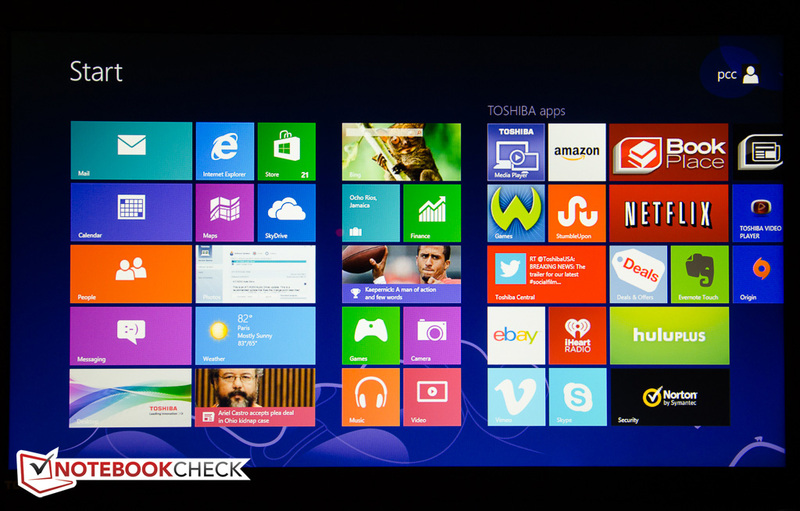 Toshiba includes a plethora of their own software titles and utilities, third-party software like Norton PC Checkup and WildTangent Games Console, as well as the obligatory 30-day trials for Office 365, Norton Internet Security, Norton Online Backup, and Norton Anti-Theft. Users who prefer a clean install will have to spend some time uninstalling the unwanted titles. 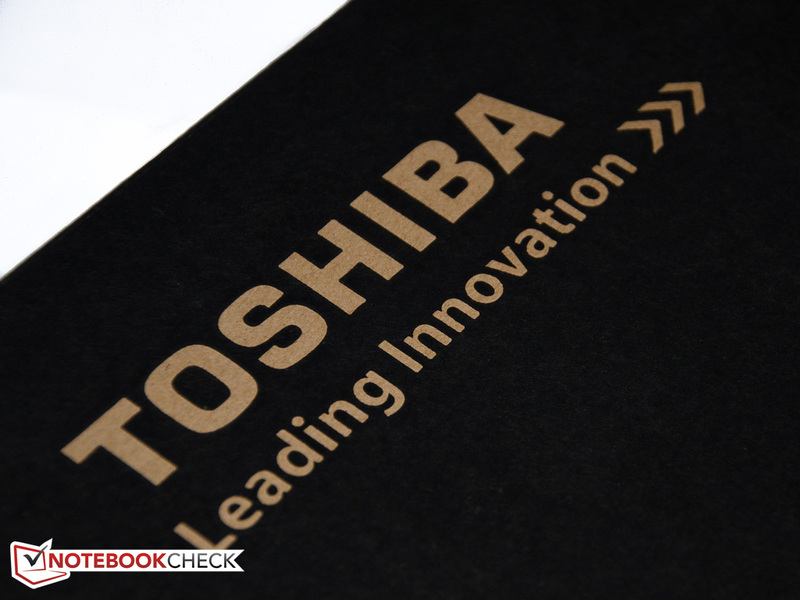 Toshiba backs the Satellite C75D with an industry-standard 12-month warranty. The manufacturer also offers warranty upgrades, extended service plans, accidental damage plans, and on-site services. 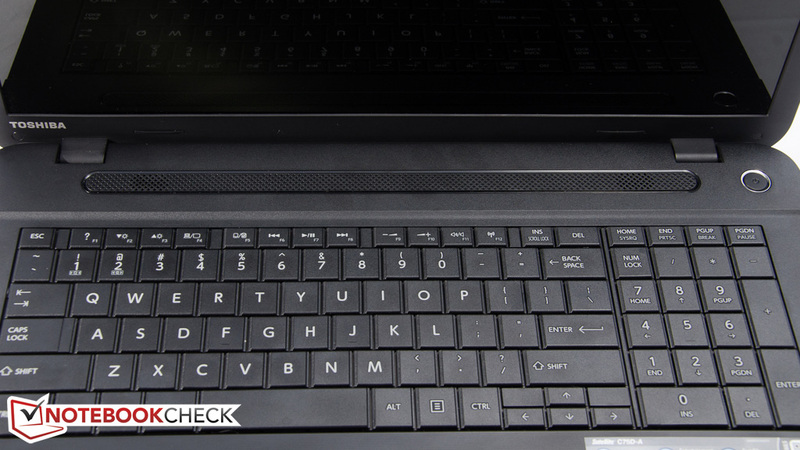 Toshiba doesn't use a modern chiclet-style keyboard but relies on a conventional design with dedicated number pad instead. The keys are fairly large (18 x 15.5 mm), completely flat with a medium stroke, and offer limited feedback. In addition to the flexing we described earlier, the keyboard feels quite cramped, since it unfortunately doesn't make use of the available space and stops one inch short of the left and right edges. 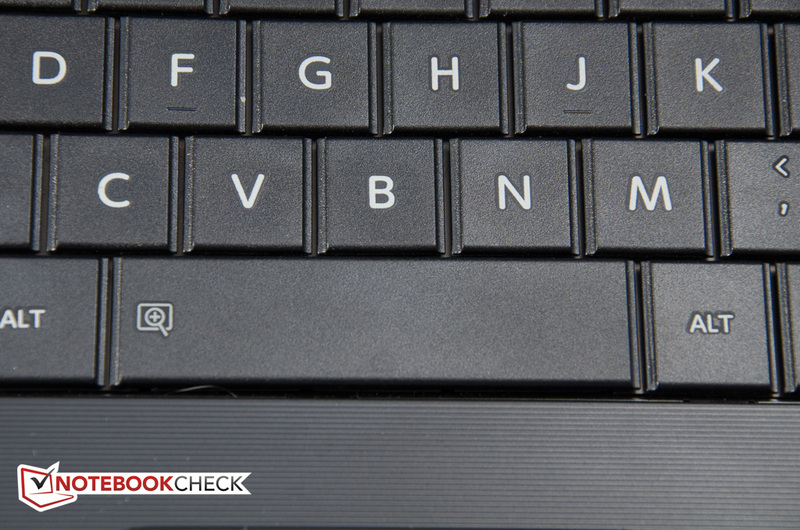 The space bar is also rather short and doesn't line up with the left and right edges of the C and M keys like it would on most notebooks. Even after some acclimation time, we still inadvertently hit the left and right Alt-keys at times instead of the space bar. The recessed touchpad features a semi-rough surface and is quite responsive, although it only measures 86 x 47 millimeter, which is smaller than we'd like. Multi-touch gestures are supported and we had no issues with scrolling, rotating, and zooming. Due to the small size, we sometimes triggered Windows 8 swipe gestures by accident.The touchpad features dedicated left and right mouse buttons with decent feedback and audible click response. 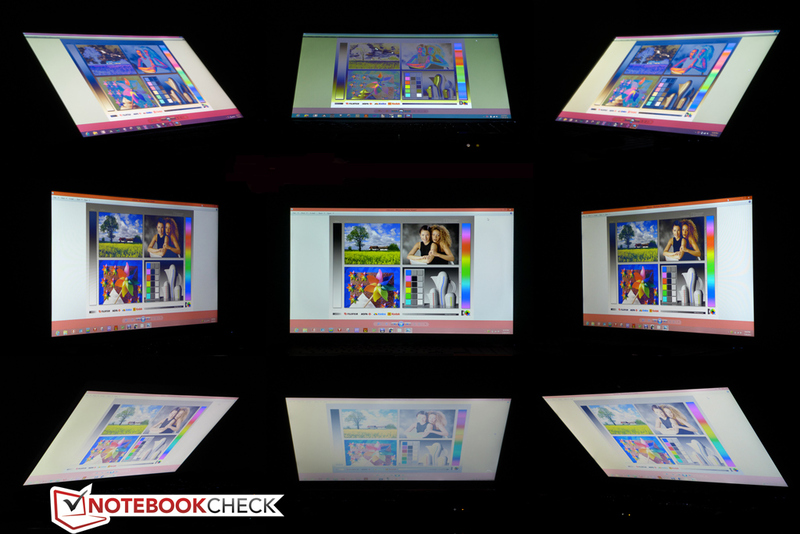 The 17.3-inch glare-type display has a resolution of 1600 x 900 pixels, cementing the notebook's budget status. Despite the low 106 DPI, text is nonetheless sharp and easy to read. While a Full-HD panel with 1920 x 1080 pixels would certainly be a nice-to-have, it can't really be expected at this price point. Despite the lower resolution, the screen real estate is sufficient to place two spreadsheets or word documents side by side. We were in for a surprise when we measured the brightness of the LG LP173WD1-TLE1, as our spectrophotometer recorded an average of 270 cd/m² - excellent for the size and price point. The aforementioned - more powerful and more expensive - Dell Inspiron 17R tops out at 234 nits, while the Asus K75DE manages 223 nits. A high-end TN HD panel with 1920 x 1080 pixels, like the non-glare Chi Mei N173HGE, which finds its way into more expensive gaming systems like the Schenker XMG P723 or the Acer Aspire V3-772G, surpasses the 300 nit threshold. Unfortunately, the display falls short in other areas: the contrast of 234:1 and black value of 1.18 are more in line with budget screens and a bit of a disappointment after the excellent brightness values. 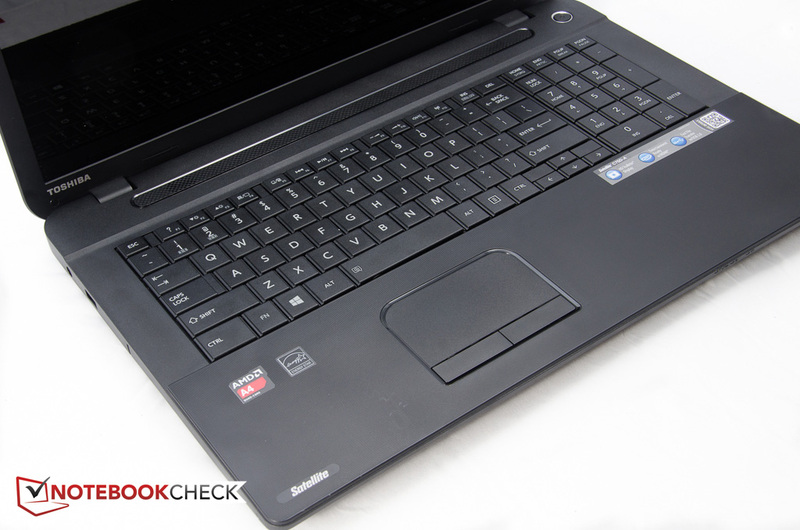 The Inspiron 17R has a contrast ratio of 350:1 and thus darker blacks than our review model. 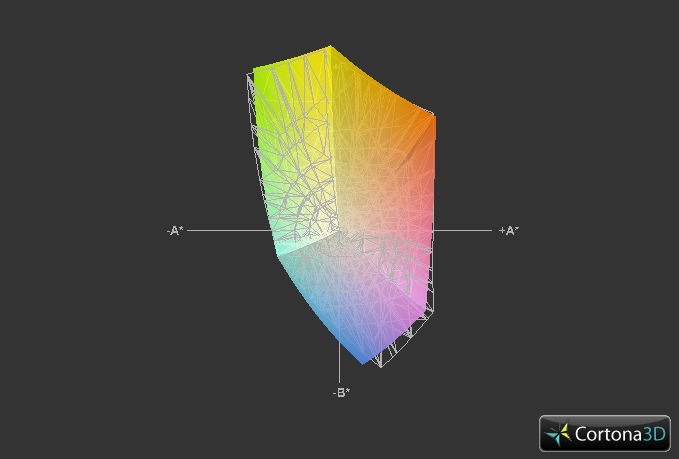 Color space reproduction is also in line with inexpensive panels at about 70% and as such acceptable. 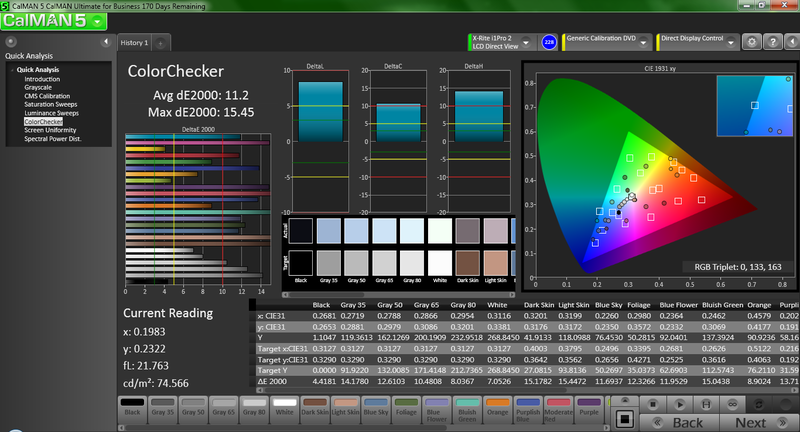 As shipped, color accuracy is not ideal throughout the saturation levels and most colors are above a DeltaE of 10 units. The display suffers from a noticeable blue cast. 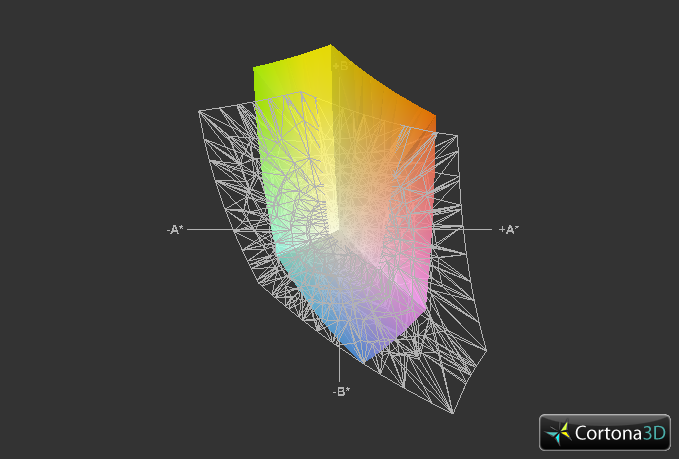 While our findings might discourage the more professional users, most home users won't have any need for a larger gamut or higher color accuracy. While the display is sufficiently bright, outdoor usability is hampered by the glare-type screen and the ensuing strong reflections as well as the rather poor contrast ratio. We should note here that the full brightness is available even when the notebook is running on battery. Viewing angle stability is typical of a lower-cost TN panel. While the picture remains fairly stable in the horizontal, deviations in the vertical cause a rapid deterioration in quality, washed-out colors, and complete inversions at more extreme angles. Properly adjusted, the display can accommodate more than one user for movie night though. 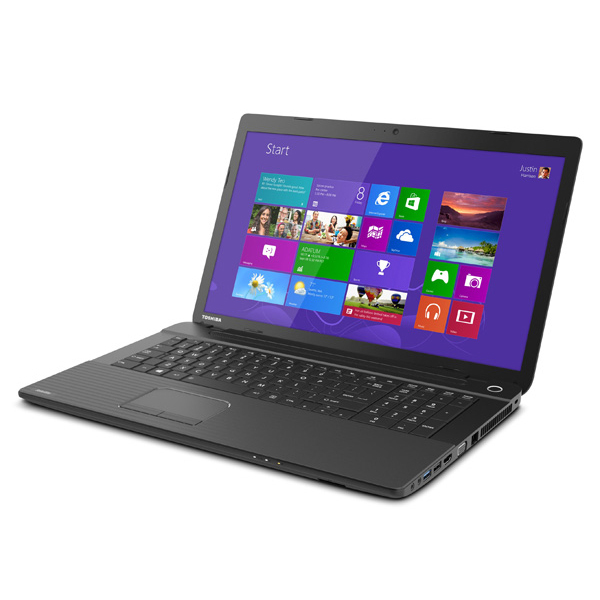 Toshiba equips the Satellite C75D with a quad-core AMD A4-5000M APU. The 15-watt Kabini processor supports DDR3L-1600 RAM and is capable of performance roughly equivalent to the dual-core Sandy Bridge Intel Pentium B960 as long as the application is able to utilize all cores. Single core performance, on the other hand, is only moderately faster than the older dual-core AMD E2-1800. 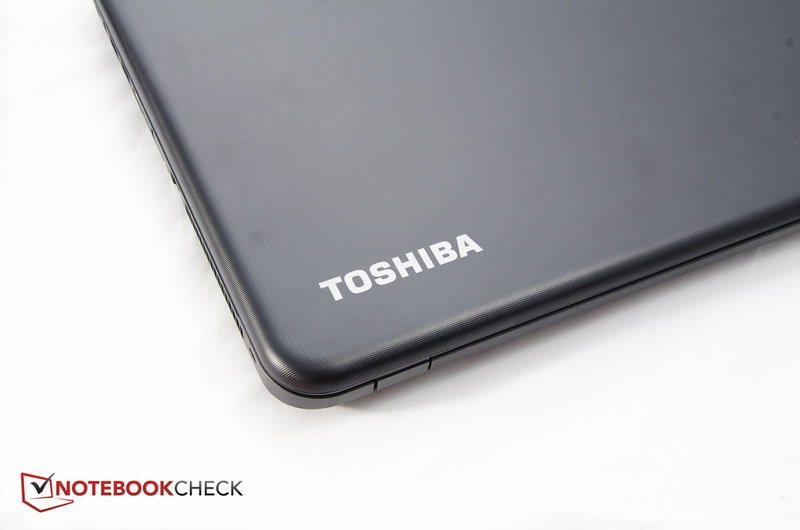 The notebooks in Toshiba's C70D-series use Intel Celeron and 3rd-generation Core i3 processors instead. The processor section of the APU idles at around 800 MHz and tops out at 1.5 GHz. A Turbo mode is not supported. The A4-5000M comes with an integrated Radeon HD 8330 graphics card which offers performance similar to Intel's HD 4000 solution depending on the benchmark used. The scores in the 3DMark 11 GPU test are more or less identical; during the Cinebench R11.5 OpenGL 64Bit test, the Radeon in our review model achieved 12.09 fps and therefore trails the HD 4000 GPU, which scored 14.6 fps on average. The GPU supports DirectX 11, idles at 267 MHz, and reaches a maximum of almost 500 MHz under load. In fact, the Radeon HD 8330 offers very similar performance to the Intel HD 4000. Kabini only has a single channel memory controller, so our configuration with 6 GB RAM - one 2 GB and one 4 GB RAM chip - does not adversely affect performance. The A-series Kabini APU features AMD's new Jaguar architecture, which replaces the previous-generation Bobcat design. The new APU is ahead of the dual-core E2-1800 in the recently reviewed 14-inch Asus X401U running the Cinebench R10 64-bit single-CPU rendering test by almost 25%, but trails the Sandy Bridge Intel Pentium B960 - released in 2011 - in the Lenovo IdeaPad G580 by more than 50%. Even when all four cores are fully utilized, the AMD A4-5000M APU still trails the dual-core Pentium B960 by roughly 20%, although it's about 120% faster than the dual-core E2-1800. Power consumption is where the AMD A4-5000M APU really shines: while the E2-1800 is in a similar league and consumes 18 watts compared to 15 watts, the Pentium B960 with its TDP of 35 watts needs more than twice as much. That makes the A4-5000M a great match for ultraportable devices or whenever heat is a concern. 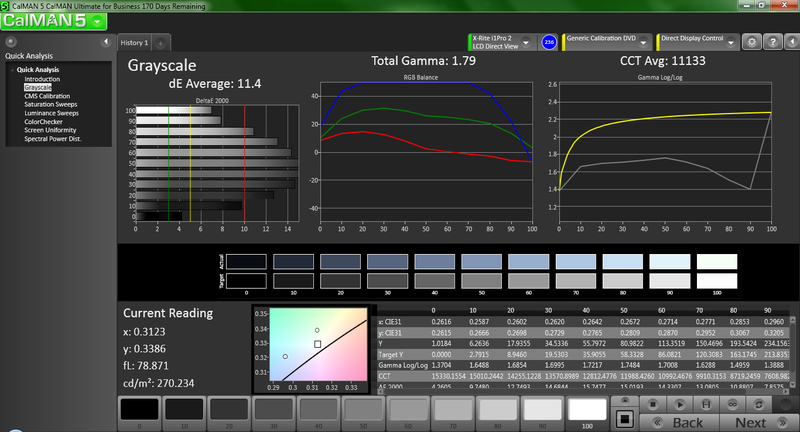 When we ran Cinebench R11.5 with the Toshiba Satellite C75D running on battery, the scores where identical. The PCMark 7 score of 1687 points is rather unimpressive and trails the 2072 points of Asus K75D-TY089H with the Intel Pentium B980 by quite a margin. 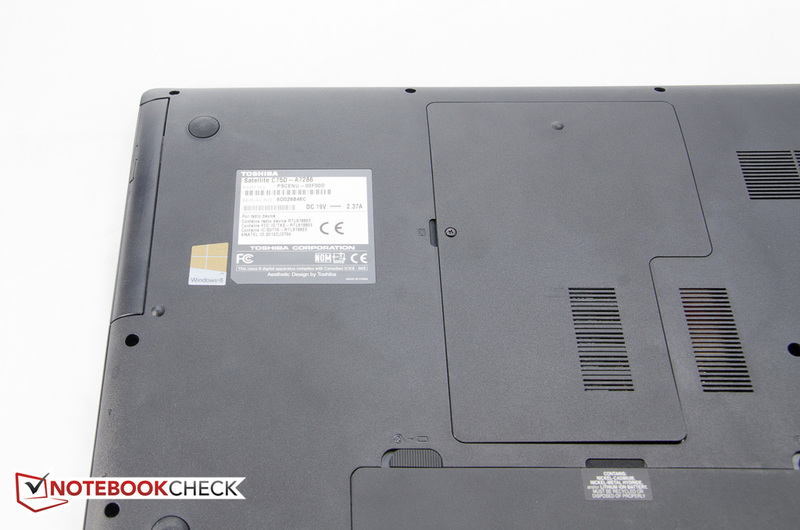 The 15.6-inch Toshiba Satellite C850-1LX, which is equipped with a Celeron 1000M processor, also scored almost 2100 points. The systems we mentioned are equipped with standard 5400 RPM hard drives, so they are on fairly even footing in that regard. The performance of the system often feels a little sluggish, as application launches are far from instantaneous. Even tasks running in the background can sometimes cause unexpected decreases in performance. 1080p movie trailers also suffered from occasional hangups and slowdowns. 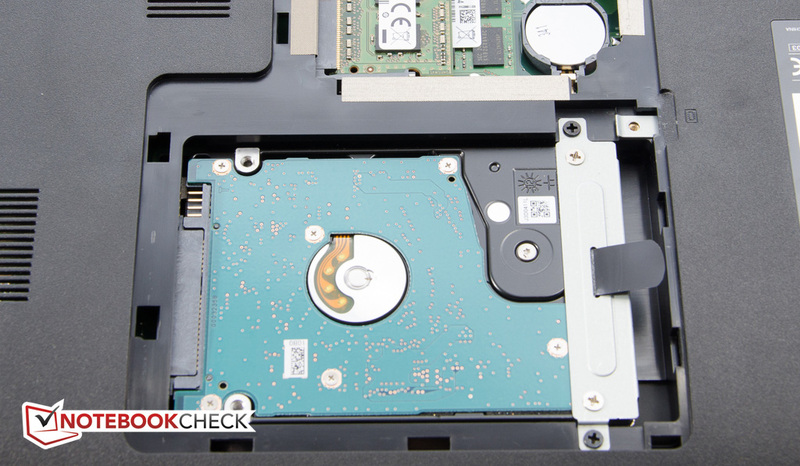 The conventional platter-based Toshiba MQ01ABF050 hard drive is par for the course. At 500GB, at least the capacity is above the going minimum of 320GB. The 7 mm, single-platter SATA III hard drive spins at 5400 RPM and transfers data at a less-than-stellar, but still acceptable rate of about 80 MB/s according to HDTune. The access time is slow at just under 20 ms. Some 5400RPM hard drives - for example the 1TB Western Digital Scorpio Blue Dell uses for the Inspiron 17R - are more than 10% faster; 7200 RPM drives upwards of 20%. 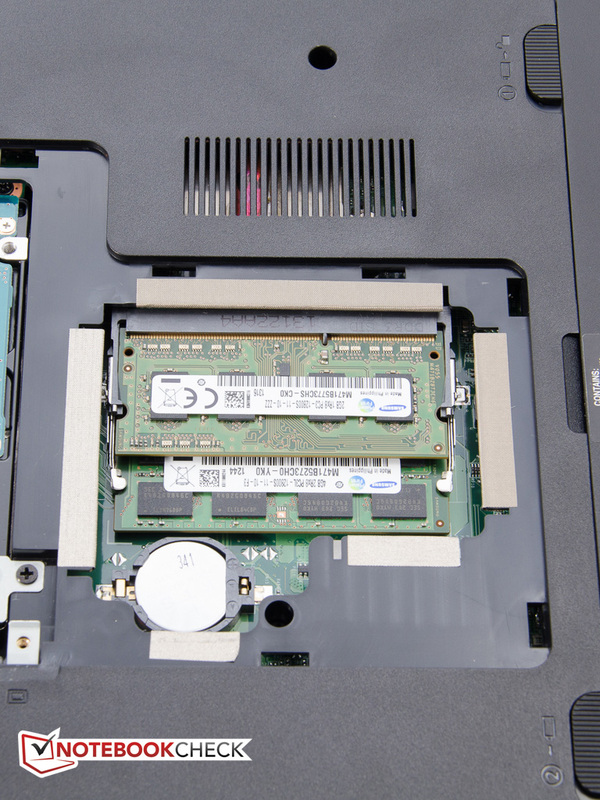 A SSD or a hybrid drive would make a lot of difference as far as responsiveness and general usability are concerned, but the cost-benefit ratio might not justify the additional expense. 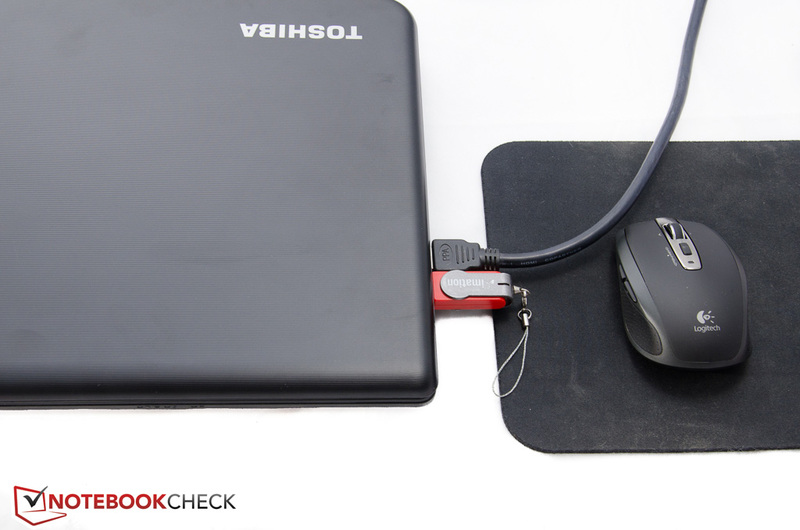 For more information and benchmarks, please take a look at our HDD and SSD list here. The integrated Radeon HD 8330 is a Direct X11.1-compatible graphics card with 128 shader cores based on the GCN architecture. The GPU has a maximum clock speed of 500 Mhz, (no Turbo mode) and accesses the main system RAM. As indicated earlier, the graphics card is by no means a powerhouse. Given the price point, the less-than-stellar gaming performance is certainly excusable. Just like the Intel GPU and other low-end integrated solutions, the HD 8330 is best suited for less demanding and older titles. To see how the AMD GPU handled various other games, please check here. Because of the low power requirements of the AMD APU, cooling requirements are also low and the fan can do its job quietly most of the time. During idle, the fan is barely audible at 32.8 dB maximum. During our stress test, the system maxed out at around 40 dB, which is still very acceptable - especially since this will rarely happen during everyday use. 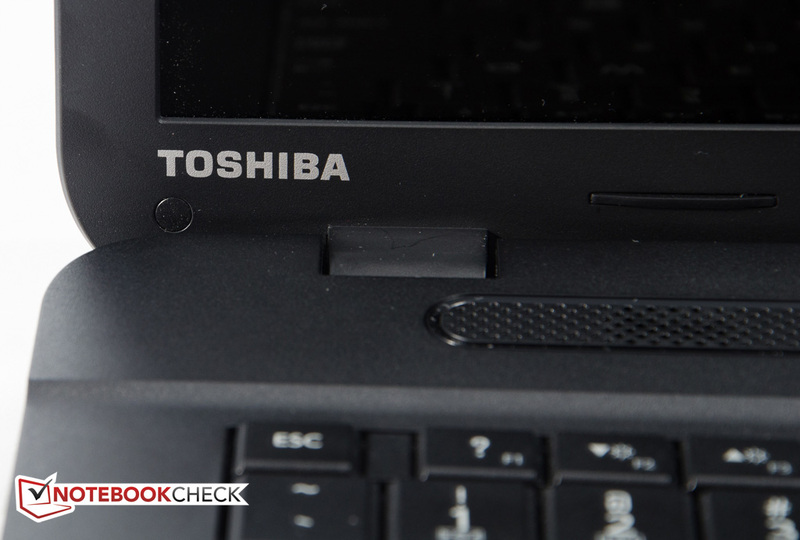 Even though the Toshiba hard drive installed in the C75D is know to be a very quiet model, we could hear ours at all times; due to the location of the drive, the clicking noise was much more pronounced when the notebook was sitting on a hard, flat surface. The Satellite C75D gets slightly warm during idle, but stays surprisingly cool under load. The left and right palm rest barely exceeded 30 degrees Celsius (ambient temperature was 25 degrees Celsius) during either scenario. Under full load, the area on the right under the exhaust fan got the hottest at about 38 degree Celsius. 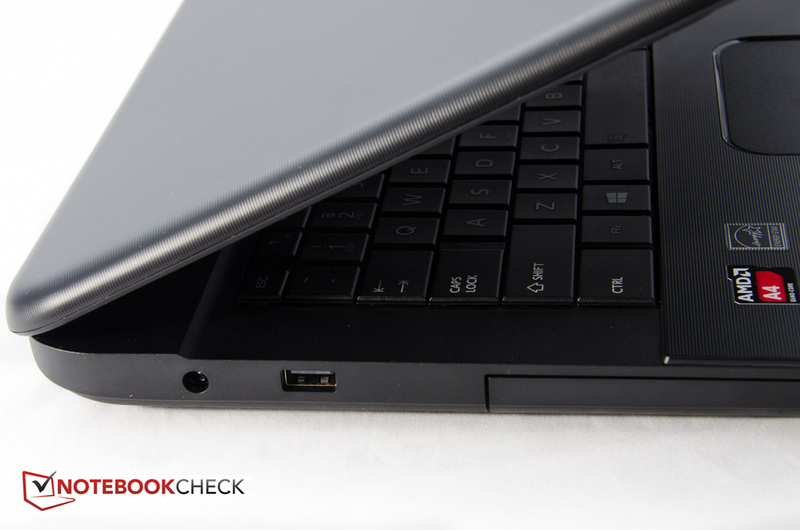 Even extended sessions with the notebook on the lap are possible with no issues. (+) In idle usage, the average temperature for the upper side is 30.2 °C / 86 F, compared to the device average of 30.9 °C / 88 F.
We run CPU and GPU intensive tests to check for throttling or other issues. With just Prime95 active, all CPU cores operated at their maximum of 1500 MHz and remained there for the duration of the test. When we ran the graphic-intensive Furmark test, the GPU section of the APU operated right at its maximum of 500 MHz. Even when we combined the two tests and ran them in parallel, both the CPU and the GPU continued at their respective frequencies without any dips or slowdowns. The temperature of the APU never exceeded 71 degrees Celsius. A repeat of 3DMark 11 one hour later revealed no difference in performance, neither did another run with the notebook disconnected from the power outlet. 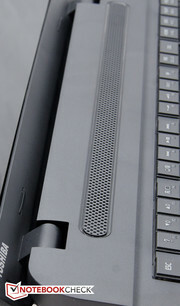 The stereo speakers are housed under a speaker grill located between the keyboard and the base of the display. While the speakers get loud enough for a medium-sized room, the output is very tinny sounding, with highs being over-emphasized and low tones and bass lacking in presence. 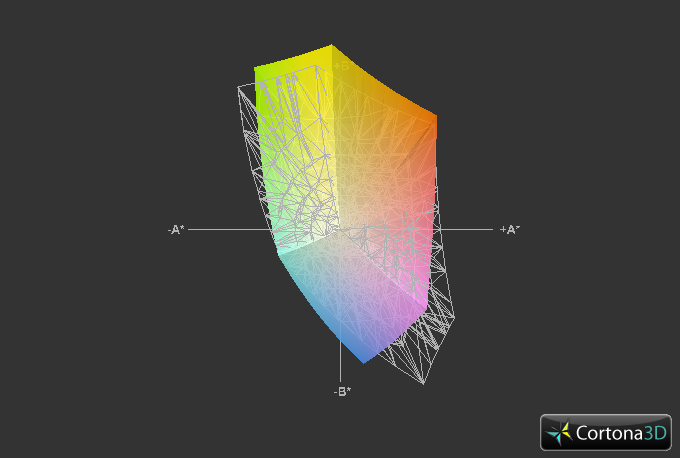 The included DTS software improves the quality slightly, but not nearly enough. Unfortunately, the output is not much better when using the headphone jack to connect external speakers or headphones. 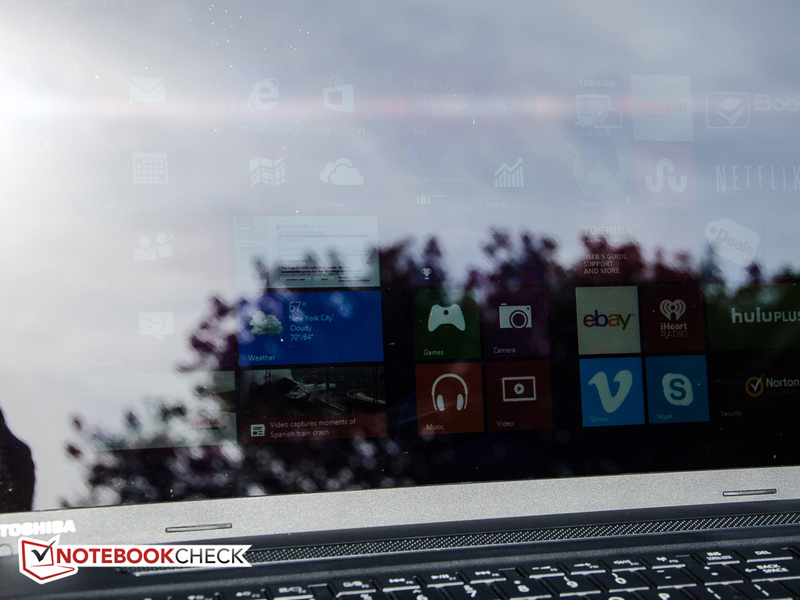 For a 17-inch system, the battery life very respectable. 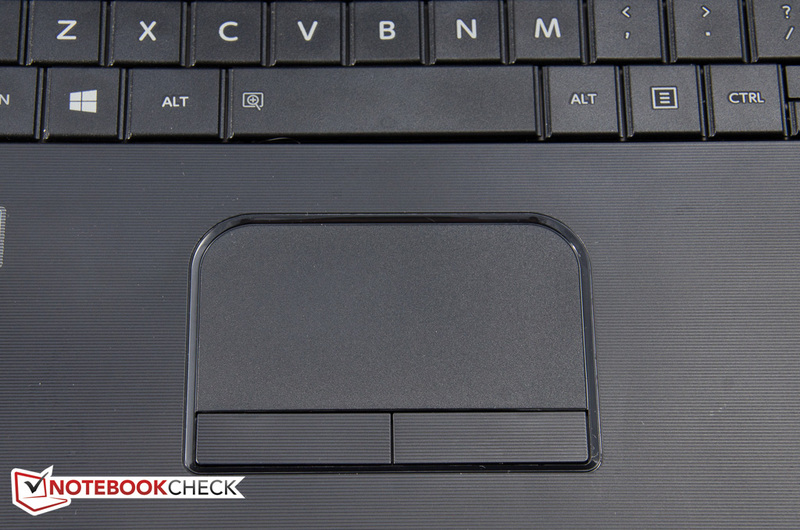 It took close to 7 hours and 30 minutes before the battery was depleted when we subjected the notebook to the Reader's test with the screen turned to minimum brightness and wireless turned off. For the more realistic WLAN-test, we simulate typical web-browsing activities with an automated script. 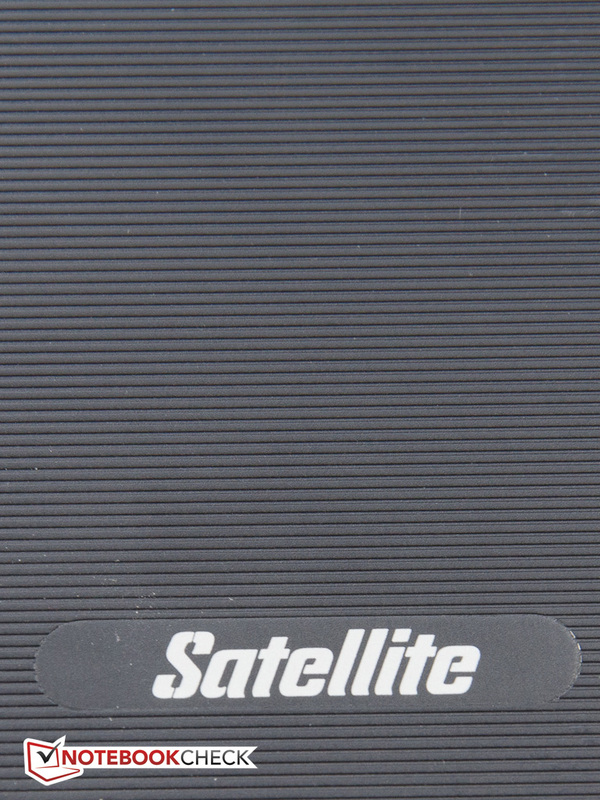 With the display brightness set to 150 cd/m2, the Satellite C75D lasted 4 hours and 9 minutes. 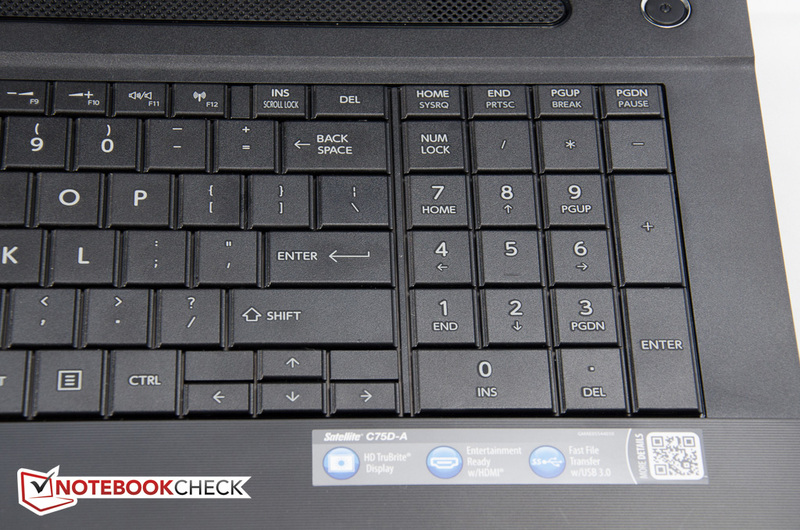 The Asus K75D-TY089H we mentioned earlier lasted 3 hours and 29 minutes. When we ran our stress test, it took 2 hours and 9 minutes before we had to plug the notebook back in; DVD playback was possible for 2 hours and 42 minutes. Recharging with the power on takes about 2 hours and 15 minutes. We might have spoken too soon when we called this notebook a "desktop replacement" at the beginning of our review . At this point, we aren't quite sure if the Toshiba Satellite C75D fits the bill, as its qualities are often contradicting: the size of the notebook with its large screen suggest a primarily desk-bound placement, but the fairly light weight, the very long battery life, and the brighter-than-average screen might convince some that the notebook is suitable for toting around. 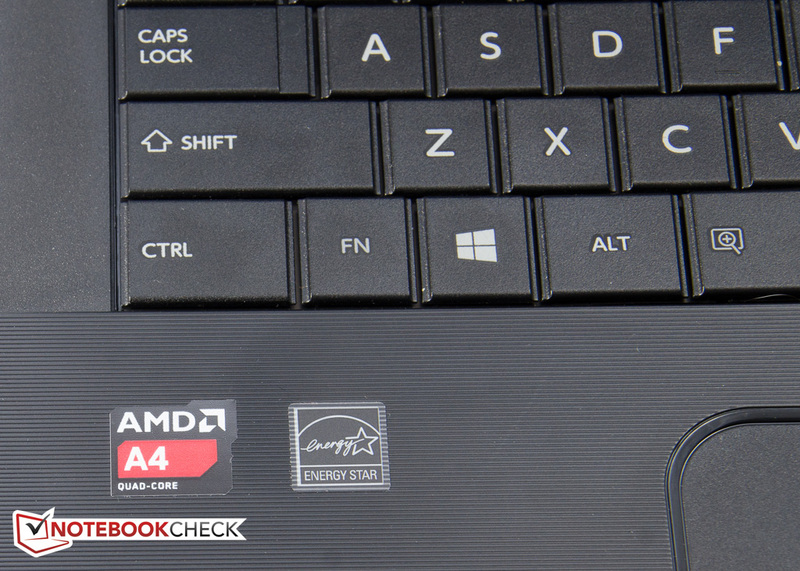 Although the AMD A4-5000M APU is no slouch compared to its older siblings, nothing changes the fact that the C75D offers rather pedestrian performance. Even older generation Intel processors outperform the AMD APU, but are generally more power-hungry. The graphics performance of the integrated Radeon GPU reminds of yesteryear, so gaming aficionados will be sorely disappointed. Users who are interested in mainstream tasks, such as social networking and light productivity, shouldn't have an issue - we just need to emphasize "light", as the system runs out of steam quickly. The Dell Inspiron 17R-5721 is a more upscale and slimmer 17-inch system with aluminum construction and Intel CPUs, which costs about $100 more. The lower-end Inspiron 17 with i3 processor features plastic construction and starts at $450 - slightly less than our review model. We were able to find a different version of the Asus K75D with the same Intel Pentium B980 for $350 online. Toshiba's Intel-based C70-series starts at $400 for a Celeron 1005M-equipped system, a version with low-end Core i3 starts at $550. All plastic with nicely rounded corners. Not a surprise at this price point: a glare-type display. Not Full-HD, but 1600 x 900 pixels should suffice in most cases. 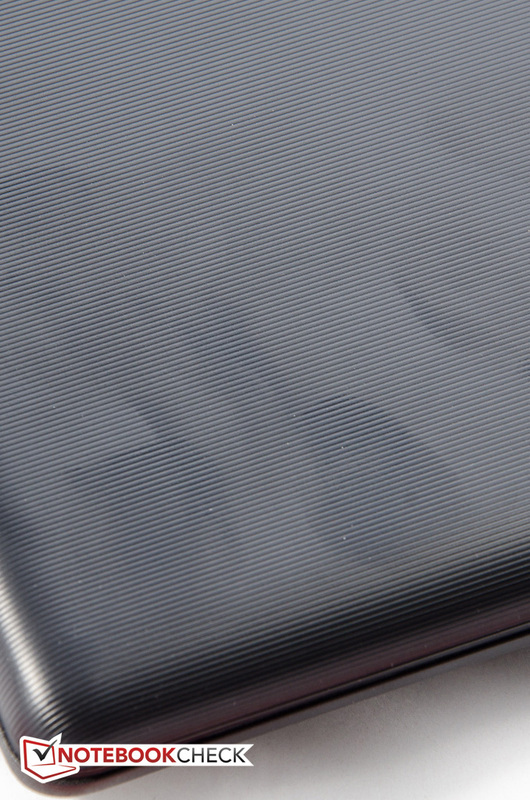 A close-up of the textured lid. The palm rest is textured just like the lid. ...but can't keep the display from bouncing. ...and needs to be rotated up and out for removal. The single maintenance cover is secured by one screw. 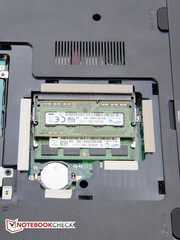 ...and the RAM modules (6 GB in our case - both slots are taken up). The speaker grill sits halfway between the keyboard and the display. On the left there is a single 2.0 USB port and the optical drive. 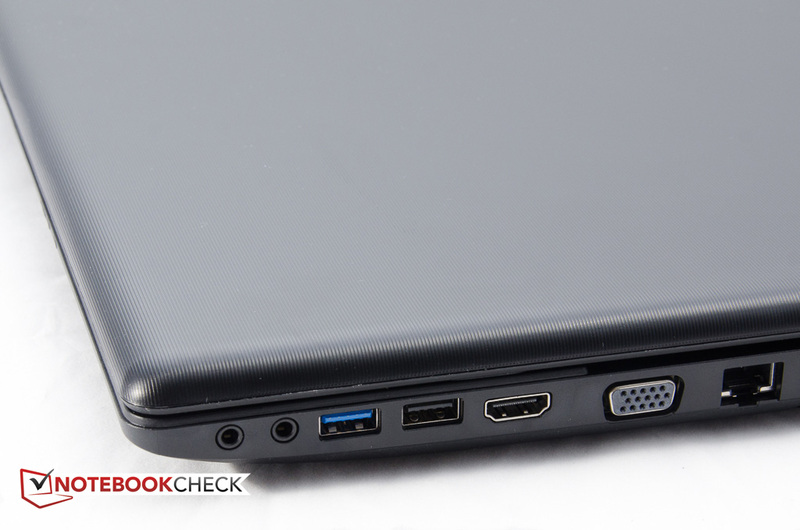 The right side features the audio ports, one USB 2.0 and one USB 3.0 port, as well as HDMI and VGA. 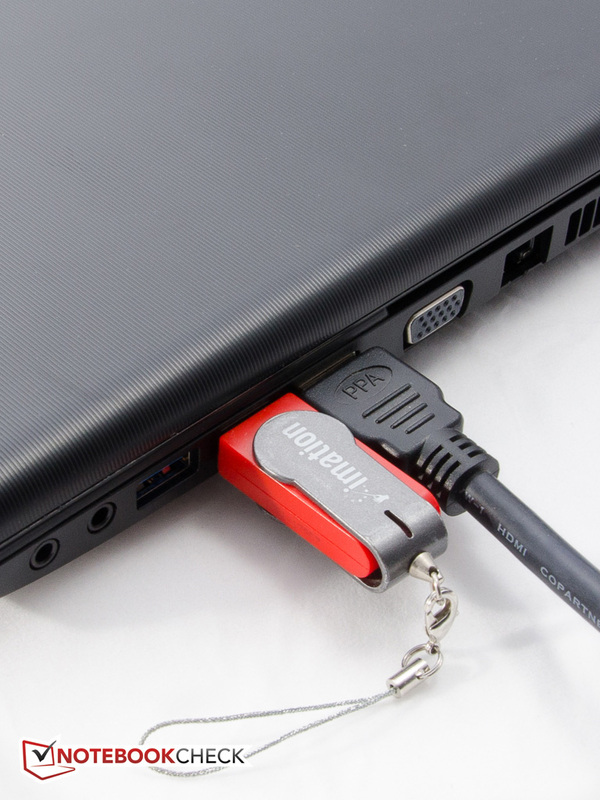 The ports are very close together: the USB thumb drive and the HDMI cable touch. The location of the HDMI port is of particular concern, as the cable gets in the way when operating an external mouse. The power adapter could be from a netbook - it's that small. 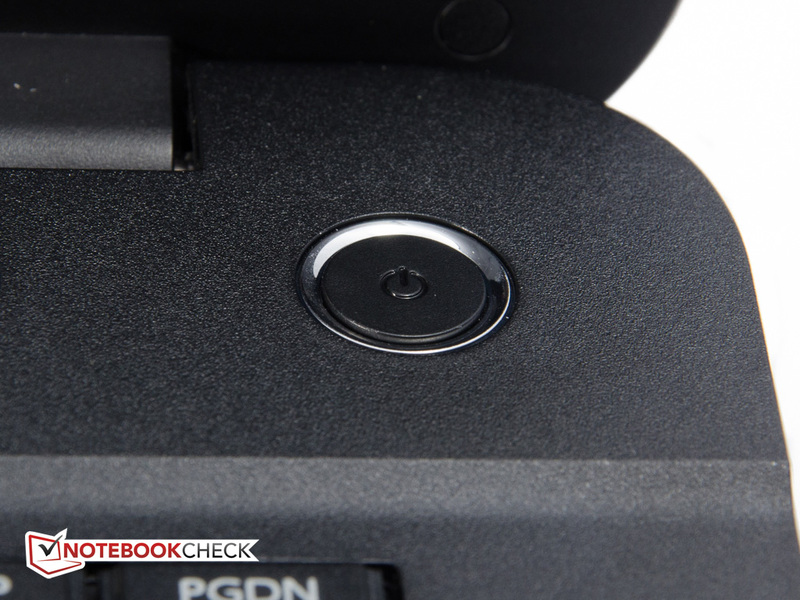 The power button lights up bluish-white when the notebook is powered on. The bright display, long battery life, and comparatively low weight. Better performance - the AMD APU is not very powerful. 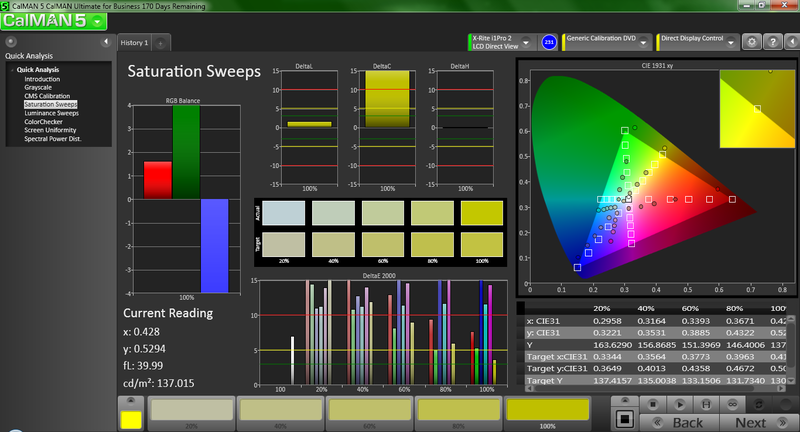 A display brightness of 270 nits is very good in this class. 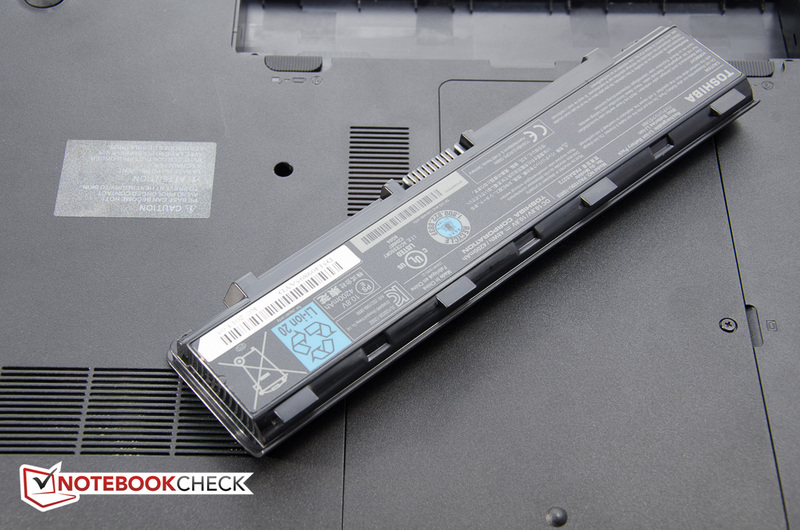 Dell Inspiron 17R-5721 or Inspiron 17. 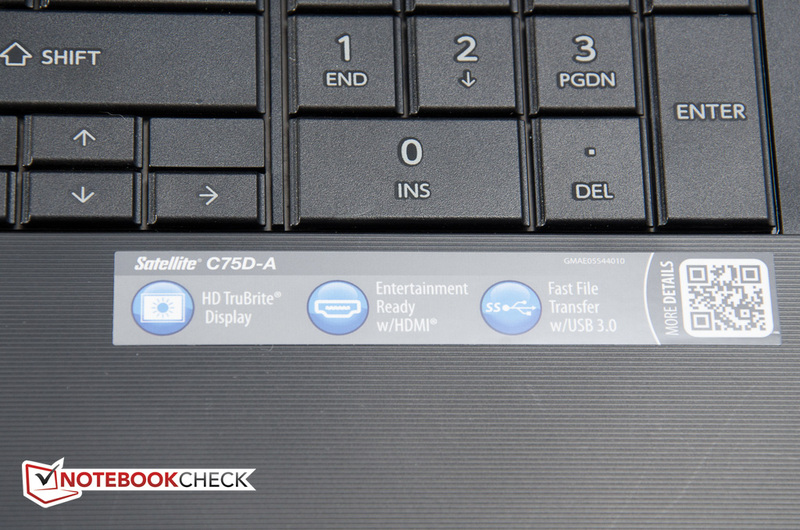 Asus K75D and Toshiba's own Intel-based C70 series. 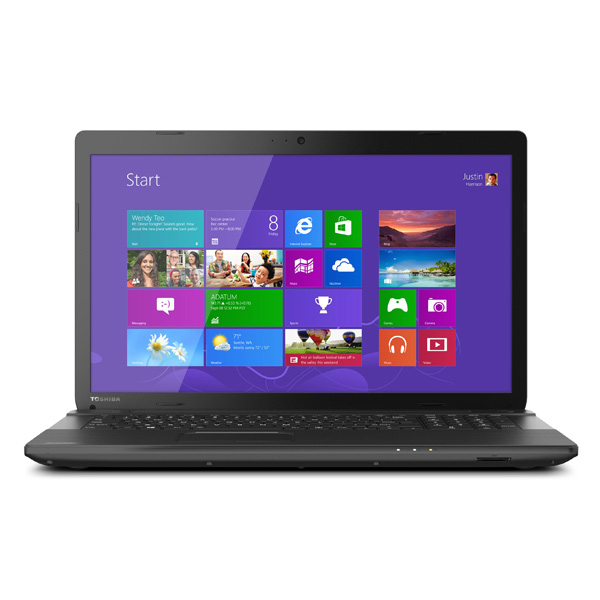 With AMD processor and dual GPUs, the Toshiba Satellite L875D-10E.